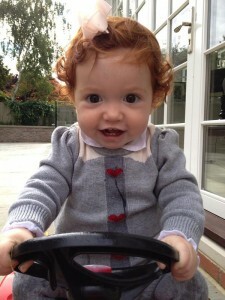 On 7 October, it will be two years since Margot was diagnosed with blood cancer. 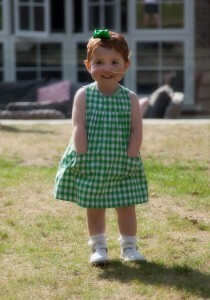 Margot was 14 months old at the time. Margot was admitted to Great Ormond Street Hospital and went straight into the Paediatric Intensive Care Unit, where she was put into an induced coma, so that she could have her blood completely replaced – it was riddled with leukaemic blasts. That was an attempt to get her onto a more stable footing, and to permit her treatment to continue. Margot remained on life support for over a week before she gradually recovered from that episode. In the initial state of shock and confusion, I thought that Margot was going to die, and imminently. She nearly did. Then, as she began to pull through I learned that she still had a chance – there was hope, because in spite of Margot simultaneously having two types of leukaemia (which is extremely rare and they still don’t know how to treat that condition), we were told that a bone marrow transplant could potentially provide Margot with a second chance at life. At the time, I knew little or nothing about blood cancer nor about stem cell transplants (or bone marrow transplants as they’re also known). And I have since learned that I was not alone ! To have a bone marrow transplant, first you need a matching donor. Initially, they check the family: siblings provide a 30% chance of a tissue type match, but neither of our other children were a match for Margot. Then I learned that there are registers of unrelated potential donors that exist, which can be searched by the transplant centres who are seeking to find tissue type matches for patients. The problem is, these registers aren’t large enough, nor are they diverse enough to provide sufficient matches for the people who need them. On average, you have 50% chance of finding your perfect match. You have a half chance at a life saving transplant. But one of the biggest issues is: if you are from an ethnic minority or if you’re mixed race like Margot, then your chance of finding your “perfect match” is only 21%. This is because in this area, unlike with blood donations, your race and ethnicity matters. That’s why we campaign for more people to join the stem cell register as potential donors, especially people from ethnic communities and those with a mixed heritage. In the UK you can register in three ways via four organisations – it’s quite complicated, which is why Team Margot is like a signpost, we inform people and guide them on how they can register – we don’t mind how people choose to register, just that they do please register. How do we measure our success ? Well – since we launched Margot’s appeal less than two years ago, tens of thousands of people in the UK alone registered as potential stem cell donors, because they were inspired by Margot or because of Team Margot’s efforts. And I am delighted to tell you that, to our knowledge, there have now been at least 10 people who have also gone on to donate their stem cells or bone marrow to someone in need; that means that our efforts are actually saving lives. One of those donors is my friend, Katrina, who joined the stem cell register after learning of Margot’s appeal and I am privileged to have witnessed her bone marrow donation earlier this year. A few weeks ago, Katrina received a letter from Delete Blood Cancer UK with the first update on her recipient, “a young adult female from America”. “Your cells have been transplanted as planned. The stem cells have travelled into the bone marrow of your patient and have begun producing new, healthy blood cells inside of the patient’s body. This process is called engraftment. We have been advised that the patient is doing “wonderful” and is proceeding well following donation. Your recipients progress has been so satisfactory that she has been discharged from hospital”. We don’t know any more about the recipient than that but we of course wish her well with her recovery and we hope that she’s one of the 50% of bone marrow transplant patients that enjoy long term survival. 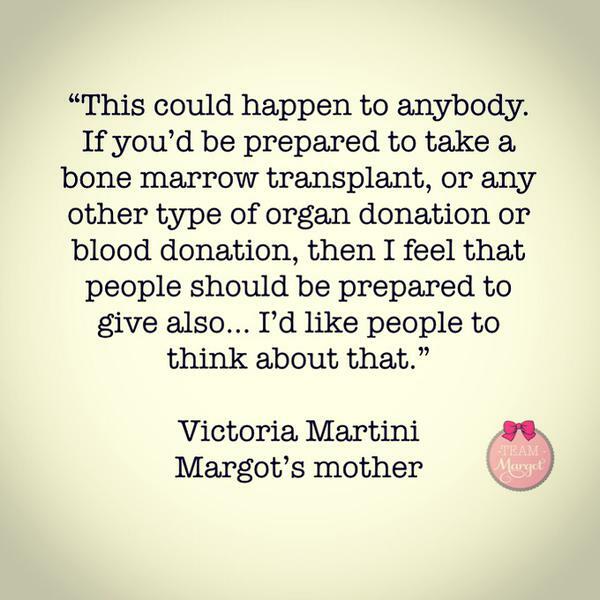 Sadly, Margot didn’t survive her blood cancer, but we are nevertheless unspeakably grateful to her donor for his miraculous gift and for the extended time and good months we had with our daughter, when we were able to see her develop & grow. So next Wednesday 7 October, on the date Margot was diagnosed, we will be launching our inaugural “Team Margot Stem Cell and Bone Marrow Awareness Day”. No such awareness day previously existed, so we decided to create one. This is an international day designed to promote awareness of the need for more potential stem cell and bone marrow donors to join not only the UK but also the international registers too. And we want to create a buzz in the week leading up to and on the 7 October – and this is where YOU can help. 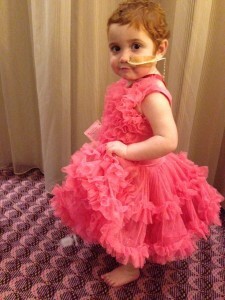 Our charity, Team Margot Foundation is about awareness & action. If you haven’t already, please consider registering as a potential donor and then encourage Just One More person to do the same. If you’re ineligible, or like so many tens of thousands of people, you have already registered, please click this link to download our awareness day poster and share it with someone you know and encourage them to consider joining the register. We value highly & give great currency to word of mouth, so that’s OUR ONLY ASK on our Awareness Day – please talk about this & tell someone, follow us online, retweet and share what we post and post your own photos on social media. Try it and see how that makes you feel.